Understanding the toll of a serious injury, motor vehicle accident, or illness has had on a person’s life is the first step in treatment. 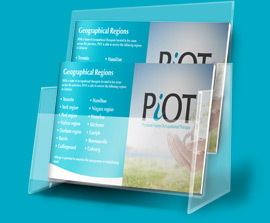 PiOT begins all treatment plans with a thorough assessment. Our assessments explore all areas of a client’s physical, cognitive, social/psycho-emotional, behavioural skills, and functional abilities. This gives us a firm understanding of exactly what impairment exists, and their effect on an individual’s daily activities (such as parenting, school, work, personal care, housework, sports, reading and leisure, etc.). The assessment is used as the basis to determine accident benefits, identify the need for other health professionals and treatment as well as to develop a customized occupational therapy treatment plan to help the client function effectively in daily life. Attendant care is a benefit to which an individual injured in a motor vehicle accident may be entitled. An Attendant Care Needs Assessment involves the assessment of an individual’s capacity to perform self-care and daily living activities. The occupational therapist will assess the individual’s physical, sensory, psychosocial, cognitive and communication function in order to determine the need for attendant care (i.e., the need for assistance with self-care tasks). A Form 1 is completed to itemize self-care tasks with which an individual requires assistance as well as the amount of money to which they are entitled for hiring a personal support worker to provide attendant care services. An assessment of an individual’s home environment is necessary to identify barriers impacting function, safety and accessibility. Occupational therapists are skilled in identifying barriers and making recommendations to improve safety, accessibility and function within the home by determining the need for assistive devices and/or home modifications. This assessment takes place in an individual’s home and includes recommendations to help individuals improve their ability to function effectively and safely in everyday life. The primary focus of this assessment is on evaluating an individual’s physical, sensory, psychosocial, cognitive and communication function with regards to their ability to carry out activities of daily living, such as their personal care, housekeeping/home maintenance, caregiving/parenting tasks and leisure/recreation pursuits as well as their vocational activities. Occupational therapists work closely with the in-hospital medical and rehabilitation team to co-ordinate a smooth and safe transition home. This typically involves an in-hospital visit to identify an individual’s needs upon discharge, as well as a visit to the home to identify any barriers that exist and to recommend any assistive devices or modifications that would improve safety and accessibility for their return home. If an individual is unable to return home, occupational therapists can assist with locating alternative living arrangements to meet the needs of the individual. This assessment determines the costs of an individual’s current and future needs (e.g., attendant care, assistive devices, medical expenses, professional services, home modifications, etc.) over the individual’s entire lifespan, as a result of injuries sustained in a motor vehicle accident or a catastrophic event. A physical demands assessment evaluates the physical, cognitive and environmental components required to perform the essential tasks of a job. A job site evaluation takes place at the individual’s pre-injury worksite and is coordinated in conjunction with the individual’s employer. It is used to evaluate the suitability of a job and/or environment to the individual. It typically involves observing the individual performing various aspects of the job within his/her abilities and tolerances. By analyzing the job demands in conjunction with the individual’s current abilities and restrictions, both assessments help to determine the capabilities of an individual and any potential barriers that may interfere with their return to work. Recommendations are provided around readiness to return to the pre-injury job and return to work planning, including accommodations, devices, workstation modifications or further interventions to support a successful return to work. This involves a comprehensive assessment of an individual’s cognitive function (e.g. memory, attention, processing speed, insight/judgment, executive function, etc.). Standardized tests allow the occupational therapist to compare relative performance of the individual to that of a group. Non-standardized cognitive tests also assess an individual’s cognitive abilities or performances but does not allow for comparison of one individual’s performance to that of another. Non-standardized cognitive tests are typically used to gather further information with respect to how an individual is functioning in their day-to-day life. The results of both standardized and non-standardized cognitive assessments are used to provide education to individuals about their functional cognitive strengths and challenges following an injury. The results can also be used to develop a cognitive rehabilitation program that includes cognitive remediation and/or compensatory strategies to maximize an individual’s cognitive function in their everyday life. A comprehensive assessment that evaluates an individual’s current physical functional tolerance level. This assessment helps to establish a baseline with regards to tasks individuals are and are not able to physically tolerate. This assessment is beneficial for return to work planning. The Assistive Devices Program (ADP) is a program operated by the Ministry of Health and provides funding to Ontario residents who have long-term physical disabilities. We have occupational therapists that are registered as “authorizers” by ADP who can determine an individual’s eligibility for the program and complete the application for funding. The assessment includes an evaluation of the individual’s condition to determine if they would benefit from a mobility device and can also determine which mobility device(s) best meet the individual’s need. An ADP funding application is then completed and sent to the Ministry of Health to apply for funding for 75% of the cost of the device. The occupational therapist can also assist the client to apply to additional sources for funding for the remaining 25%, if required. The Driver’s Rehabilitation Assessment is a comprehensive assessment which includes a clinical interview as well as an on road, drive along evaluation. The assessment takes place at the client’s home (no need to drive anywhere) and is jointly conducted by the Occupational Therapist and a Licensed Driving Instructor. They will discuss with the client any concerning issues that there might be surrounding the return to driving and conduct any necessary cognitive and physical testing. The on road portion of the assessment begins in the client’s residential area and as their comfort level allows, progresses to multilane roads and the highway.